I am currently traveling for work and since I can’t work in my shop I decided to put a little time into planning to makes some needed upgrades to the shop. A few years ago I had built a table for my shop. It was to fulfill multiple jobs and provide some needed storage in the shop. I found and then modified a design from www.thewoodwhisperer.com. Marc Spagnuolo’s table design fit almost all of my needs. Well fast forward till now and the table has worked great and really helped in the shop. One of my design modifications was to put the table on casters. What I didn’t do was to add additional support when I put the four casters in corners of the base. Over time due to the extreme weight of the very massive torsion box table top and the lack of structural support in the base it has began to sag in the middle. Right now if you put a straight edge along the length of table there is about a 1/4 inch sag. Now for most of its intended purposes that’s not that big of a deal. But using the table as an assembly table it can cause issues for some glue ups. I have also added several other tools like my jointer, planer, miter saw station, and router table to the shop. These additions have taken up a lot of my available floor space I had before. Whats all this mean you ask… well let me tell you. It is time for upgrade!!! Let me start by saying that once again I’ll be taking some design ideas from other sources. This time the top will be from Ron Paulk at www.paulkhomes.com. 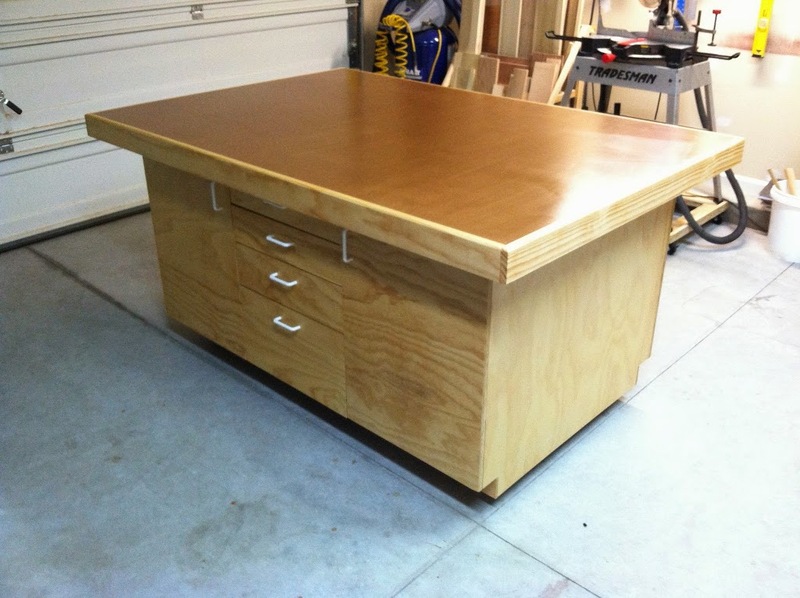 He created a mobile worktable that is pretty amazing. He is a general contractor and designed it to be mobile. I like how functional the top was. It is constructed similar to a multi-function table by Festool but with the stability of a torsion box top. It has holes drilled in the top to allow clamping and the open side allows for temporary storage of tools you are using and a place to clamp to the side of the table as well. I still want to keep some of the storage of my old table but wanted to shrink its overall footprint. The main priority it still needs to serve is as an out feed table for my table saw, an assembly table, and a workbench. 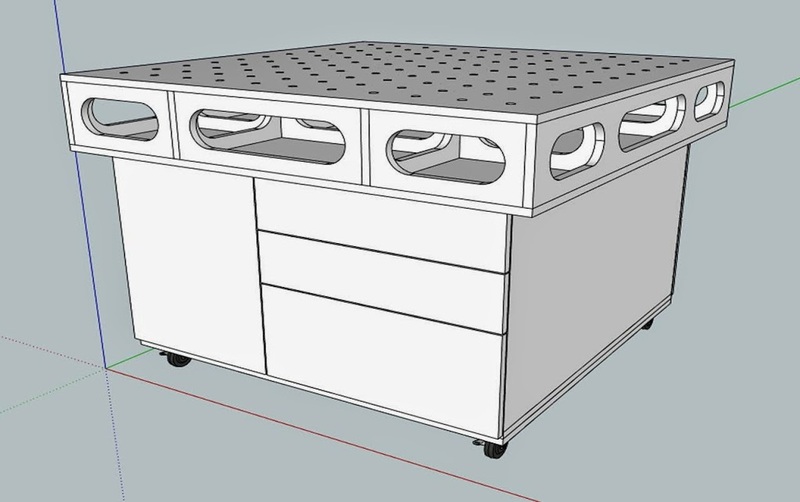 So after a many hours of research and a couple hours of playing around on Sketchup… I present my next workbench plan. The overall dimensions of the tabletop is 4′ X 4″. This will give still allow for plenty of work surface while freeing up a little real estate in the shop. I am going to build the entire project from 3/4 inch cabinet grade plywood. Two of the opposing sides are designed the same with a cabinet door and three large drawers which will be mounted on full extension slides. The table will once again be on casters but will be properly supported to hold the weight of the table. I also took the time to do a cut list for the project to minimize waste. 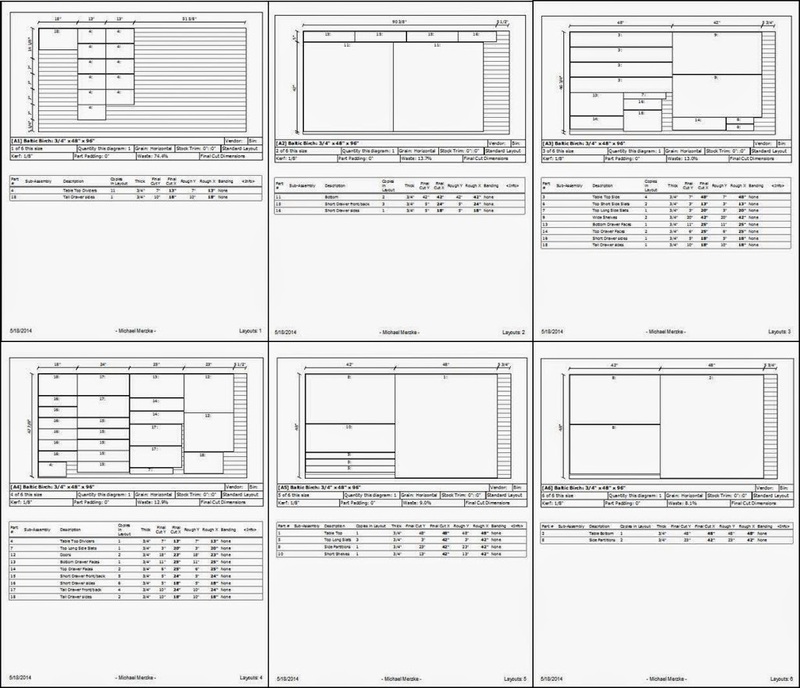 I use a cut list primarily on large projects to help me figure out my lumber needs and also when dealing with sheet goods to help minimize waste. Now all that’s left is for me to get home, purchase some lumber, and start making some sawdust.